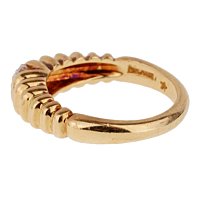 A beautiful diamond solitaire gold vintage ring from Bulgari. 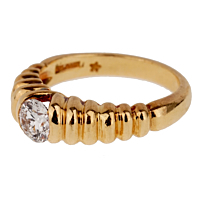 This ring features a round brilliant cut diamond set in stunning 18k yellow gold. The unique scalloped pattern on the band adds a special, opulent touch to this otherwise classically simple design. Stunning yet streamlined, this ring has just enough glamour to really stand out.